Sediment Toxicity Assessment provides the latest information regarding how to evaluate sediment contamination and its effects on aquatic ecosystems. It presents an integrated ecosystem approach by detailing effective assessment methods, considerations, and effects to each major component of marine and freshwater systems, including the benthos, plankton, and fish communities. The approaches emphasize defining habitat conditions (physical and chemical), toxicant bioavailability, factors influencing toxicity (lab and field), biomarkers, acute and chronic toxicity, study design, collection methods, and EPA management strategies. The book also explains how to integrate the assessments. 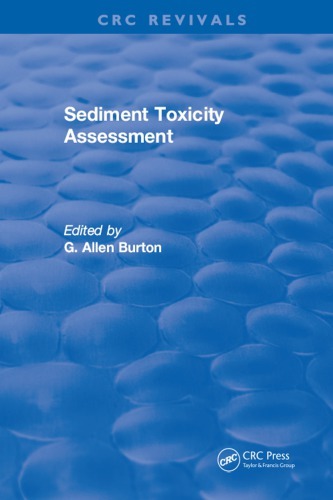 Sediment Toxicity Assessment will be useful to to all environmental managers, environmental scientists, ecotoxicologists, environmental regulators, aquatic ecologists, environmental contractors and consultants, instructors, students, conservation commissions, and environmental activist organizations. GMT+8, 2019-4-19 14:28 , Processed in 0.154661 second(s), 29 queries .